SINSINAWA, Wis.—Composer, artist and author Dan Schutte will be at Sinsinawa Mound for a concert Friday, April 22, and a retreat Saturday, April 23. Both are open to the public, with a freewill offering being accepted. 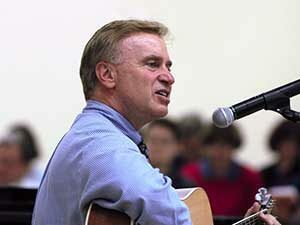 Schutte has been composing worship music for more than 40 years. Many of his most celebrated pieces, including “Here I Am, Lord”; “City of God”; and “Sing a New Song,” come from his years of collaboration with the St. Louis Jesuits. The concert is at 7 p.m. Friday. From 8:30 a.m. to noon on Saturday, Schutte will lead Renewing Faith through Prayer using his book, “Walking the Sacred Path: Spiritual Exercises for Today.” He engages participants in music, gospel stories, and reflection based on the writings of St. Ignatius of Loyola. This retreat will focus on prayer life and the faithful God who loves us unconditionally. For more information, contact Guest Services at 608-748-4411 or visit our website at www.sinsinawa.org. Sinsinawa Mound, the Motherhouse for the Sinsinawa Dominican Sisters, is located in southwest Wisconsin on County Road Z, off Highway 11, about five miles northeast of Dubuque.